Last September, Cal Poly students started their academic year in a little bit of a shock. SLO Transit, which serves the university with public transportation, rolled out a new bus schedule that summer—and it did not favor Mustang riders. CATCH THE BUS SLO Transit will provide supplemental service to Cal Poly again in 2018-19, after a reduction in service last year caused campus uproar. "Bus schedules are so inconvenient and do not at all align with student schedules," wrote one student. "I have been late to class numerous times because the bus doesn't come on time," stated another. "The bus has left [me] stranded multiple times with little options." "Makes me feel extremely unsafe walking to and from campus through dimly lit neighborhoods alone." Those were just a few of the responses submitted as part of a student led online survey about the transit system, launched shortly after the start of the school year. Of the 123 respondents, more than half reported having been denied entry onto a bus due to full capacity; a quarter said they'd missed class or work as a result; and 80 percent said they had to walk home from campus because buses didn't run late enough. "We made this report because I think people respond to data-driven analysis," said survey organizer Matt Klepfer, a recent Cal Poly grad. "The report overwhelmingly said people are not getting to where they need to go, and it's a crisis. People weren't going to class, weren't going to work." Cal Poly students, staff, and faculty account for 58 percent of SLO Transit's ridership. It's a service that the university subsidizes, at close to $500,000 per year. The changes to the bus schedule came about as a byproduct of SLO Transit's "short range transit plan" for 2016-21, which Transit Manager Gamaliel Anguiano told New Times was based on a combination of data and public input. Overall, the five-year plan is meant to boost the safety, efficiency, and equity of the system. "SLO Transit is a public transportation system trying to serve the needs of everyone in SLO," Anguiano explained. "A student at Cal Poly might have different needs than the grandmother that has a dialysis appointment, from the parolee who needs to get to court, from the student who needs to get to Laguna Middle School. ... We're improving our transit system for the benefit of everyone." Anguiano said the system's on-time performance, safety, and fuel efficiency (consumption is down 15,000 gallons per year) have all improved. Other community populations, like middle school students, are now using the bus more than ever. But he acknowledged that the data used to create the plan likely undershot Cal Poly's demand for service, which is also increasing "significantly" each year. The dissatisfaction captured in the students' 2017 survey caused a stink big enough to spur change. 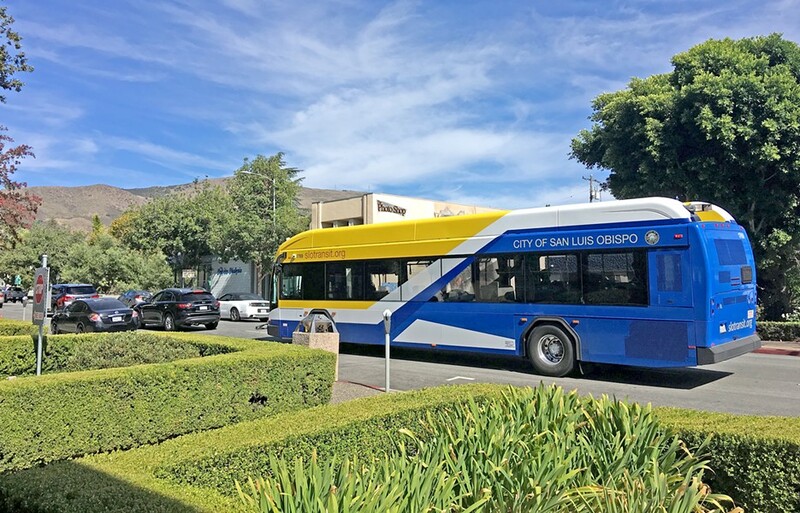 Less than a week after it was published, SLO Transit announced it would boost service to the routes most popular with students. "It definitely solved some of the big problems," Klepfer said. "I think there's still crowding on some of the buses, [but] things are much better than they were." This revised bus schedule is what Cal Poly students should expect going into the 2018-19 school year, Anguiano said. The supplemental service, which included adding one bus to the city's fleet, comes at an increased cost to Cal Poly of $7,889 per year—for a total contract of $475,196. Klepfer, and other students who responded to the survey, laid some blame for the service gap on Cal Poly, since it's responsible for providing the funding levels needed for adequate service. Cal Poly spokesman Matt Lazier denied that funding was an issue, stating that the university's contribution for bus service continues to go up each year. "There was not a reduction in funding on the university's part," Lazier said. "As to why the changes you reference were made to SLO Transit routes, I again would steer you to the city, as they are the service provider." Cuesta College students also rely heavily on their bus system, the SLO County Regional Transportation Authority (RTA), to get to and from campus. "Cuesta is actually one of our busiest bus stops at RTA. It's really well-used," said Mary Gardner, RTA community relations manager. But while SLO city riders clamor for more service across the board, the RTA is having a tougher time with demand. Overall bus ridership is down year over year, mirroring a nationwide trend, Gardner said. Despite that, Route 14, which runs between campus and the SLO County Government Center, now has a new schedule with more trips. "We were able to increase the frequency and shift the times to better meet the students' needs, especially when they leave class," Gardner said. In addition to Cuesta's bus stop moving locations, which caused some confusion, the bus and school schedules didn't always line up. Gardner said students getting out of class waited as long as 45 minutes for buses, and many sought other transportation options. This year, she said, buses will arrive more promptly. But for Cuesta students who live in communities farther from campus, like in North or South County, depending on public transit is still a challenge. RTA's latest bus leaving campus is 9:50 p.m., but that will just take you to downtown SLO. The last bus leaving SLO to South County communities is at 8:33 p.m. The same is true for the North County route. Expanding bus service to those regions farther from Cuesta's central campus requires more funding. "The issue is SLO County is considered relatively rural," Gardner said. "That's why [buses come] hourly rather than in a metropolitan area. We don't have the human population to support that. We wish we had more buses and bus services." RTA is hoping amenities like free bus WiFi, which it's currently piloting on Route 10 from SLO to Santa Maria, will lead to better ridership and more revenue. Incoming Cuesta President Jill Stearns said the college's accessibility weighs on her mind.